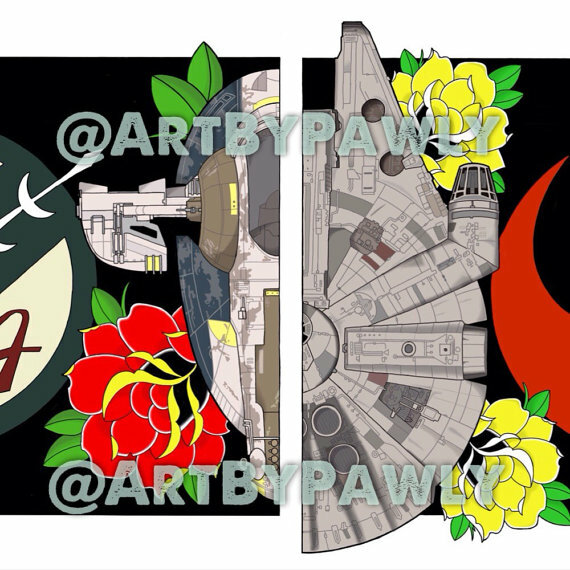 These Star Wars Ships prints by ArtbyPawly are new on ETSY. The first in a series features the Millennium Falcon and Slave 1 and is only $15. The artist will continue with Luke’s X-Wing, Vader’s Tie Fighter and a Snowspeeder. My first thought was that the Falcon was reminiscent of Steve Anderson’s Battle of Yavin prints, but the Falcon looks like a new render. I have to sat that i think they look pretty cool and i’m looking forward to seeing the new ships when they’re released. There’s a tattoo mottif that runs through the series. This entry was posted in Art and tagged Art, ArtByPawly, Millenium Falcon, Millennium Falcon, Slave 1, Star Wars. Bookmark the permalink.